Our favorite pond (southwest corner of Stone School and Morgan Roads) was alive and kicking with very loud frogs calls, not only from the wood frog, but also from spring peepers and chorus frogs. This recording really gives a feel for the exuberance and volume! The wood frog's unique call sounds kind of like a chuckling duck or two metal stress-relief balls being rubbed together. The spring peepers sound like high-pitched birds singing, and it's hard to hear the chorus frogs. 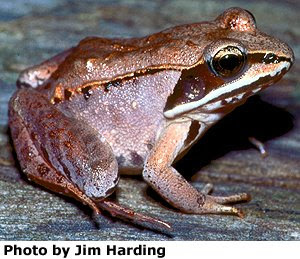 In this recording, it's easy to pick out the wood frogs from the spring peepers. We noticed that when a car drove by, the wood frogs stopped calling, but the spring peepers kept right on going. So we waited for a car to pass and then started recording, so that you first hear only spring peepers and then, gradually, a wood frog starts and then they all chime in. There were also a few chorus frogs (whose call sounds kind of like running your finger down a plastic comb) in the pond, but it was hard to hear them above the peepers and wood frogs. (The peepers were everywhere in the pond, but the woods were concentrated in one fairly small area.) There were, however, two chorus frogs calling in a pond on the other side of the road, which you can distinctly hear here. As reported last time, wood frogs have "explosive breeding" which means they only call for about two weeks (in late March/early April in southeastern Michigan), whereas most other frogs call/mate for a month or more. Wood frogs hibernate on land and have a glucose-based "antifreeze" in their blood that gets them through the long and harsh Michigan winters. Wood frogs prefer moist, wooded habitat and breed in vernal pools, flood areas, forested swamps, and still backwaters. Wood frogs lay eggs communally, meaning each female deposits her eggs into one larger grouping. The globular egg mass increases the number of eggs that turn into tadpoles (which takes two months) by helping the eggs stay moist and warm, and reducing predation (the eggs get eaten from the outside in). In general, very few frog eggs ever turn into tadpoles let alone frogs because so many of them are eaten by other animals. Fortunately, frogs lay a LOT of eggs to ensure some survive (spring peepers lay about 750-1,200 eggs each!) This communal egg laying also explains why the woodies we heard were all grouped in one little area. Hi Monica, I am learning so much. I can imagine you out at night listening for the frog calls. You are such a scientist! I know this comment won't get lost since it is the first one! Oh, my goodness, we have those over here but it sounds as if yours are having a woodstock concert! I'm about a month away from my peepers sounding. That is a cute little frog. I don't think any of the frogs here have starting looking for love yet. I'll have to keep an ear out. We don't have any of those neat frogs, only Spring Peepers & Bullfrogs, the latter of which is so loud, the kids complained last summer that it kept them up at night. Monica, this was so very interesting1 At first is was hard to pick out the different calls, but the more I listened I could detect the differences. Your description of the calls is right on! I loved the graphics you used while I listened-wow. In the chorus recording it sounded like running a finger up a comb and then down a comb. Is it true that frogs only hear their kind? I read that somewhere. Thanks for the great frog call tutorial. I really am enjoying learning about these frogs I hear each night. When I played your recording hubby was like, "Did you open the window?" Nope, but it is nice to hear the chorus inside! Oh wow..great post..I am getting my frog and toad CDs out to try and I say try to pick out and report the frogs to Frogwatch. The peepers are pretty easy and then it's all downhill for me. Your recordings and examples are really helpful. You made a great ambassador for our froggy friends and reminds me that I have to feed our resident african clawed frog here ....keep up the great work...Michelle.. I didn't realize you had to survey by listening. It seems like fun (altho maybe a little cold), sitting in a remote spot and listening. Trying to separate the different sounds. Very interesting, Monica, my Scorpio/Michigan friend ... I love toads and frogs, another thing in common. Enjoy this gorgeous spring day ... Happy April! Monica I miss the sound of frogs now that I read your post. If I were home I would here them as they live in my pond back home. I'll just have to wait until May as I'm here for another month! Frogs and toads are lovely - I recently worked on a mural in glasshouses at a botanic garden, in the company of toads and crickets! Ooh, I loved those recordings! Thanks so much for including them. What fun your frog count must have been. Thanks for dropping by my blog and introducing yourself. Fingers crossed I'll make it to the SF! I'm really looking forward to it. A most fine looking and sounding frog Monica - thanks for such an informative post. This is exciting stuff! We will have to listen to the recording now. The recordings are great. We could distinguish the frog calls neatly, great quality recording. And what wonderful sound! Yay to nature! Thank you for sharing, especially the frog calls. I used to have a pond at a house I previously lived in and didn't realize how much I missed their music until I heard this. Thank you for taking the time to do this. That frog count sounds like fun! Glad you got to hear the wood frogs at least...now I feel really lucky that I get to see them.